DI 4-12-88 Shang 'supports' minorities Support services head promotes ethnic diversity at the UI By Paul Dunt The Daily Iowan Back in the late 1950s when Florida was home to more alligators than people and DisneyWorld was but a glint in Walt's eye, UI Director of Special Support Services Paul Shang was growing up, an Asian in a predominately white rural community near Orlando. Shang's parents came to the Sunshine State from china in the late 1940s, and as a child he attended the local elementary school in the town of Apopka. "It was a kind of surprising thing that they moved there," Shang said. At that time the United States was facing major social change, he said, recalling prejudice his color often invoked. "Being of a minority I was subject of verbal and physical harrassment." he said. "People who are minorities can expect it to happen. It happened pretty often in Florida." BUT BY THE time he entered his teens the word of the Rev. Martin Luther King Jr. was spreading across the continent and especially into the South Desegregation was appearing on the national agenda. Paul Shang "It was the era when affirmative action policies were being discussed for the first time. Those issues were real issues then. The whole notion of desegregation in the South was the major issue." Shang said. In 1969, Shang enrolled in Florida State University and soon became active on the campus, campaigning for social issues. He was able to continue his studies after being awarded the Florida State University Fellowship, a program to encourage minority students to attend graduate school. Shang was one of the first recipients and would not have been able to afford graduate school without the award. "AT THE TIME, it made all the difference in the world," he said. In 1977, Shang began to work in minority affairs and special programs as a research assistant at Florida State University, and in 1978 he earned his doctorate in philosophy. It was his interest in working with students that first drew him into studying philosophy, he said. Although intending to find a career in this field. Shang said he soon realized he could fulfill his ambitions for social change better by helping ethnic minority students. "Because of my enthusiasm for social issues and my belief in Martin Luther King and other people and my involvement in student activity, this would be a way I could do all those things" Shang said. "I have always believed that many social issues could be addressed by further education. 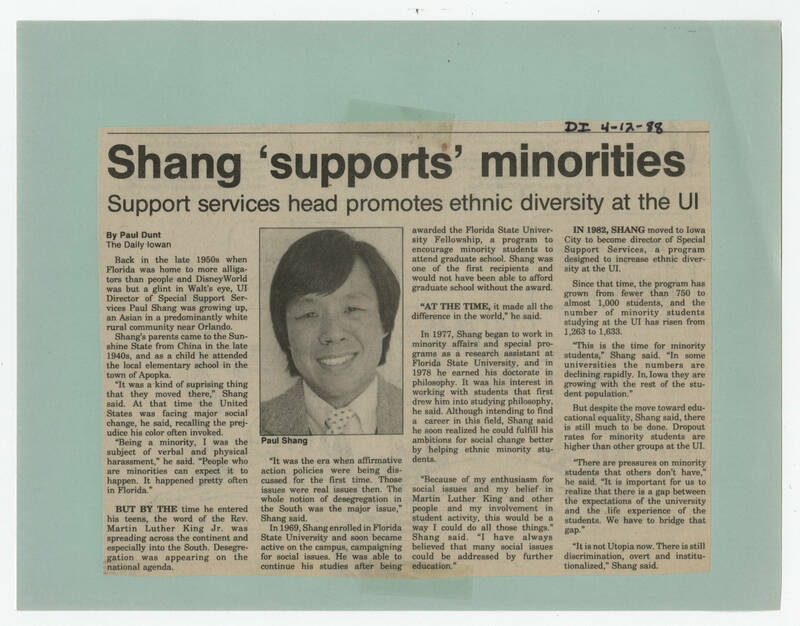 IN 1982, SHANG moved to Iowa City to become director of Special Support Services, a program designed to increase ethnic diversity at the UI. Since that time, the program has grown from fewer than 750 to almost 1,000 studnts and the number of minority students studying at the UI has risen from 1,263 to 1,633. "This is the time for minority students," Shang said, "In some universities the numbers are declining rapidly. In Iowa they are growing with the rest of the student population" But despite the move toward educational equality, Shang said there is still much to be done. Dropout rates for minority students are higher than other groups at the UI. "There are pressures on minority students that others don't have." he said. "It is important for us to realize that there is a gap between the expectations of the university and the life experience of the students. We have to bridge that gap." "It is not Utopia now. There is still discrimination, overt and institutionalized," Shang said.